I’m so excited to be able to do something new this year. Most of you won’t think anything of it, but I get to decorate my vintage mantel for Christmas and hang stockings from something different than a shelf! Oh the Joys of decorating around a fireplace, even if it a DIY vintage mantel with fake birch wood in the middle. I’ve also joined with a group of other great bloggers to share a bit of beautiful Christmas decor. I’ll be sharing my vintage style Christmas Mantel. If you are coming here from Kristen’s blog, White Arrows Home, then welcome. I love Kristen’s blog and all her rustic decor! If you read to the bottom you will see a lot of other great Christmas inspiration from some very talented ladies. What’s your favorite style of Christmas decor? As a child I loved to see bright red and greens and colored lights. The older I get, though, the more I can see my style leaning towards muted colors and a vintage style. I love the look of flocked greenery with hints of reds and greens, but nothing too bright or overwhelming. My vintage mantel is white, as is the clock that sits above my mantel. I knew I wanted a flocked white look for my Christmas decor, but I worried it might be too much white. I found a great flocked 9′ garland at Wal-Mart for $12, and I knew I could at least try it and see how it looked. Below is a close up of how it looks on my mantel. I love it and I don’t think it’s too much white! What do you think? After I arranged the garland around the clock and the vintage mantel, it was time to add the stockings. I purchased these stockings at a boutique in Birmingham, AL many years ago and had them embroidered with our names, but you can see similar personalized stockings from Amazon below. This is an affiliate link. I will receive a small commission from anything purchased from this link, but rest assured you will pay nothing more for it. After I hung the stockings I added a few Christmas goodies I had from years past. The believe in miracles sign and the star were both from Hobby Lobby. The sleigh and the two small trees were both from the Target dollar spot last year. So what do you think of my “muted” Christmas decor? I think it’s just enough color. I’m so happy I can hang my stockings on a real (sort of?) fireplace mantel this year. Thanks for stopping by and I hope you’ve been inspired to repurpose or upcycle something of your own. 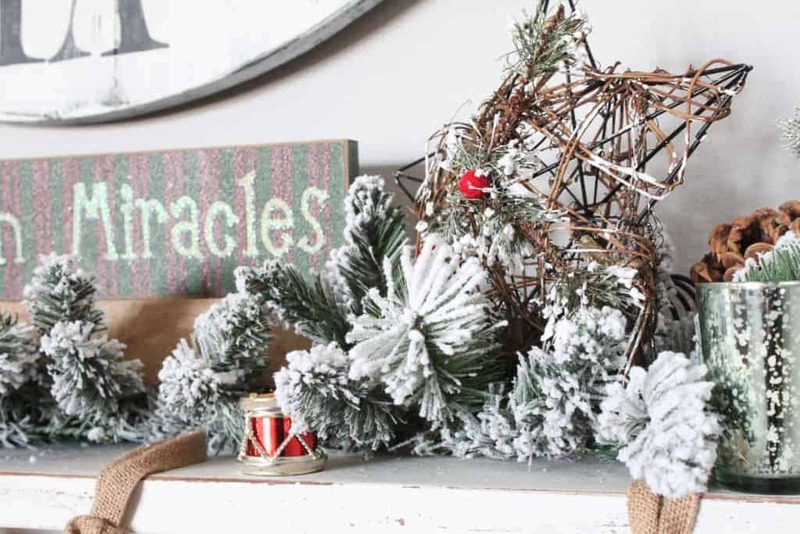 Next on the blog hop Christmas mantel list is Kristen and Vicki, a mother and daughter due who blog over at Timeless Creations, LLC. Make sure you check it out! Never too much white:) You mantel looks so festive and I love the flocked garland! Happy holidays! You’re right, there’s just nothing like a mantel when you’ve been using a shelf for a while. So exciting! Loving all your muted colors…just perfect! You did such a beautiful job Lindsey! I love your stockings! You’re so creative! Merry Christmas to you and yours! Lindsey! I love your vintage inspired mantel! My favorite part is the flocked garland! Merry Christmas! Lindsey you’ve created a beautiful mantle! It’s like a winter wonderland!! Oh Lindsey! This is so lovely! All the vintage touches make me smile! You have such a beautiful mantel! 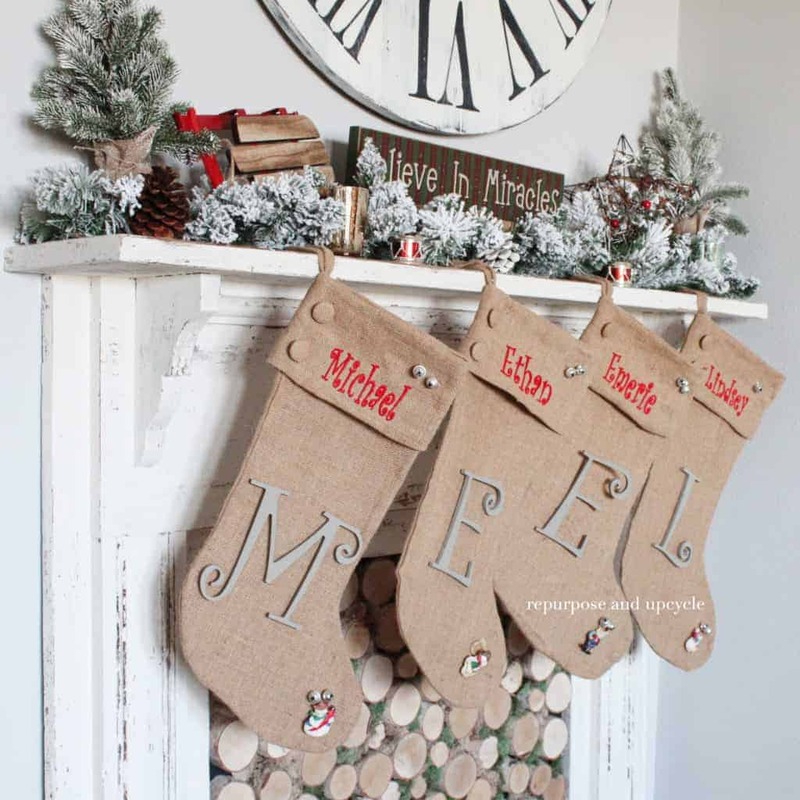 I love you personalized the stockings! The logs in your vintage fireplace are so wonderful! Just love it and all the details you added to your mantle! I’ll never think there’s too much white, and what a beautiful fireplace! 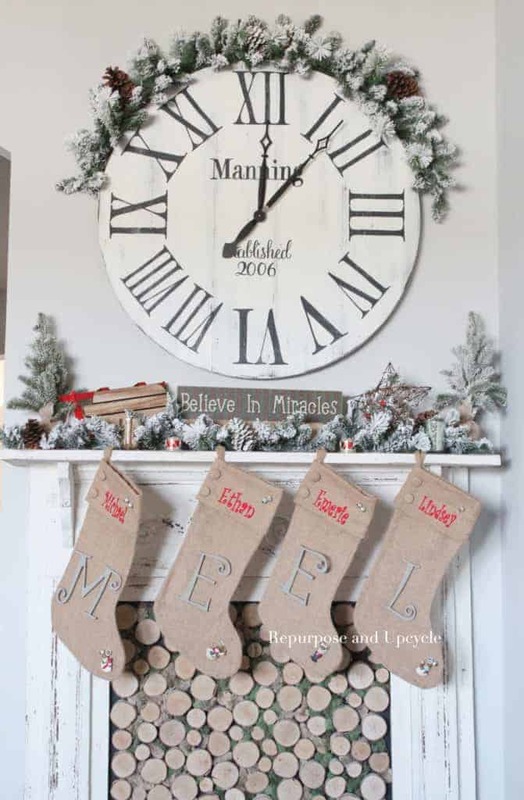 The flocked garland is gorgeous and love your clock too! I can just imagine how much you enjoyed decorating your mantle! Thx for joining me again, friend… gorgeous as always! Just when I tell myself I’m not a “neutral” home decor type person, I see something like your terrific Christmas mantel and I change my mind! This is perfect! Everything from the fabulous clock to the flocked garland to the lovely stockings to the wonderful log edge fireplace filler is amazing! So warm and welcoming! Your fireplace looks amazing. Love your stockings!! Oh my gosh – Love your clock! It’s definitely not too much white, that garland looks so nice! Girl I loved what you did today! 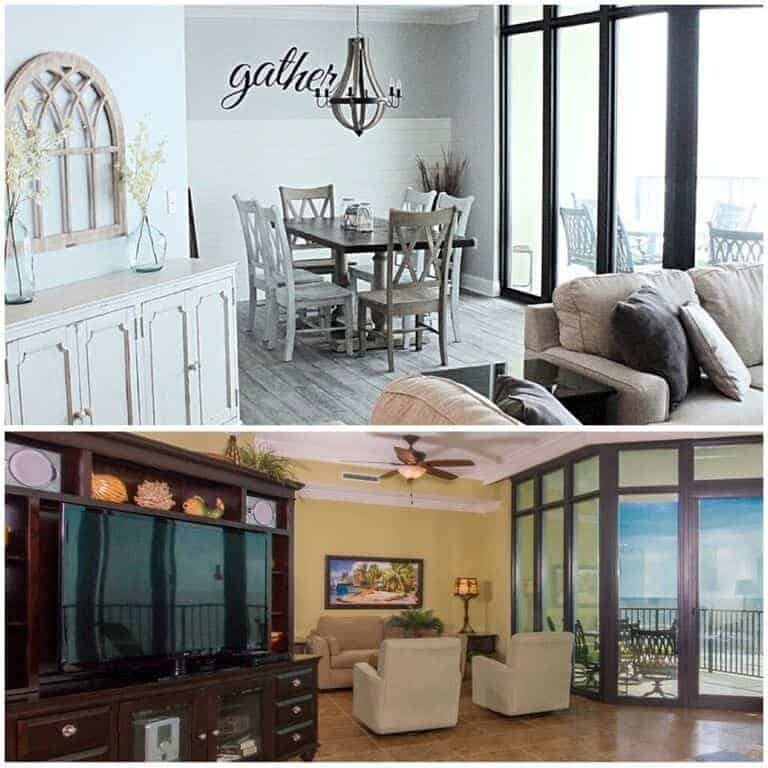 I learned so much and loved being on this home tour with you! I absolutely love your mantel Lindsey! Happy Holidays!!! I also have a mantel at a fake fireplace. I love what you’ve done with yours and you have just enough color. It’s perfect. I’m a fan of lots of white, too. Your mantel looks so pretty, especially with that giant clock on the wall. Such a beautiful fireplace!! I love the vintage look!! Thanks Christine! This has been a great blog hop and I’m glad you’re a part of it. Your vintage mantel and decor are beautiful! We totally understand your excitement. Growing up in south Florida we never had fireplaces or mantels and always felt cheated, especially at Christmastime LOL. So glad that you have that vintage beauty! Merry Christmas! Oh my goodness, I LOVE your mantel!! I love vintage Christmas but mu mantel is more Griswald style haha. I have a giant clock above my mantel too and I was wondering how I could decorate, thanks for the inspiration! This is so pretty! I love the greenery framing the clock! Thanks for stopping by Party in Your PJs! This is so gorgeous because it is so simple! 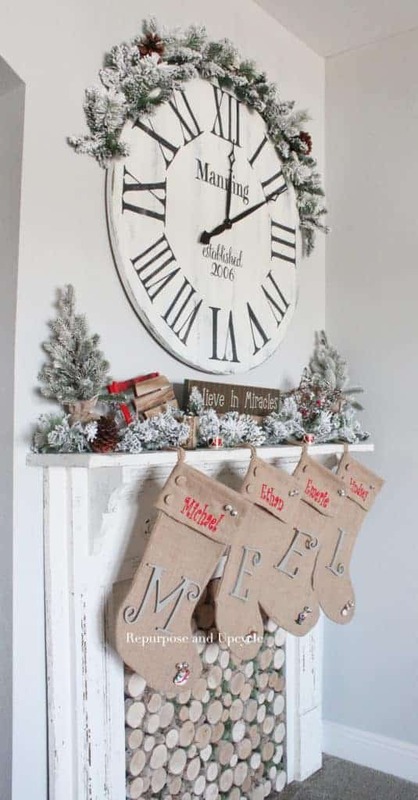 Love that you put garland over the clock and the mantel is perfect! 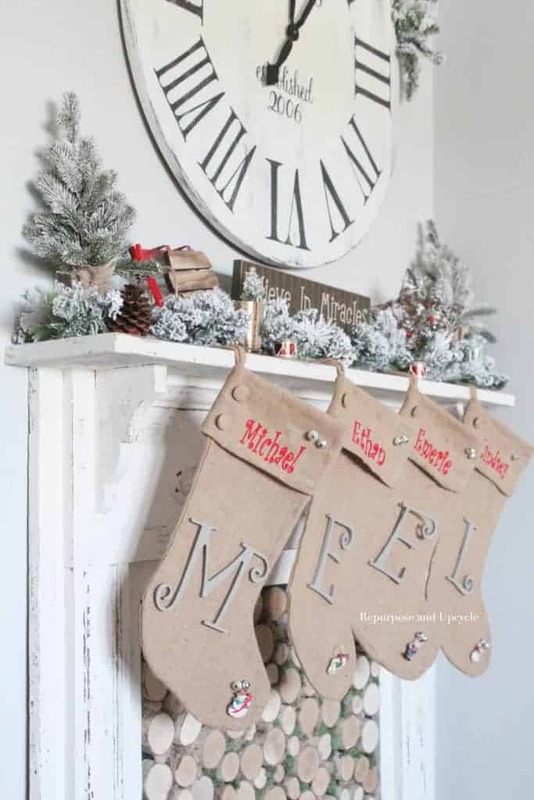 Your mantle is so rustic and sweet and I love the garland over the clock and the stockings are great! 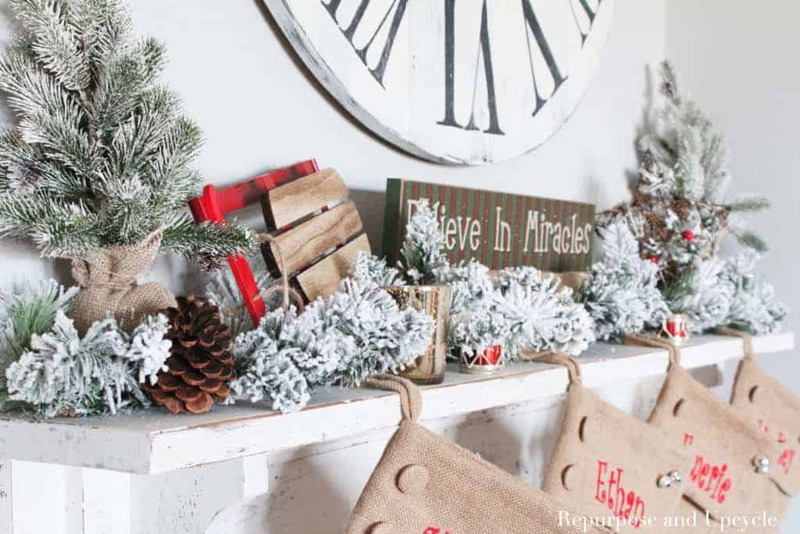 What a beautiful mantel for Christmas…and no, I don’t think it’s too much white! Thanks so much for sharing at the #happynowlinkup! Such a gorgeous mantel! I have been more about neutrals and muted colors as I’ve gotten older, too. I have that same sleigh from the Target dollar spot. 🙂 I never thought of buying a flocked garland, but I am going to think about using one next year! You can beat the $12 price tag either! So lovely and welcoming. Not too much white at all, just perfect. Great taste! I loved the start, nice touch. I love this so much. I agree you can never have too much white at Christmas time. It’s beautiful! I am loving the muted, “vintage-vibe for Christmas as well. 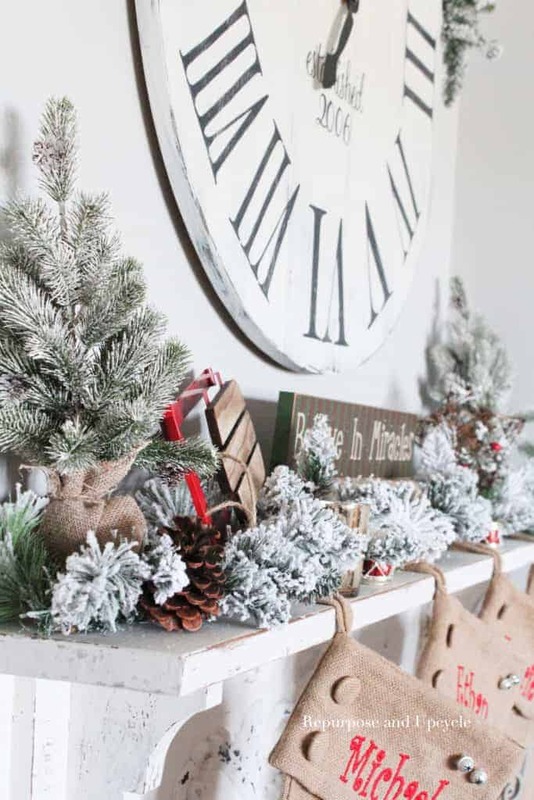 Love your mantel… My goal next year is to figure out the whole flocking thing 🙂 Merry Christmas! I think it’s beautiful! Thanks for joining the To Grandma’s House We Go link party! Your mantel looks wonderful. I love all the white decor, especially how the flocking blends with it. Thanks! I followed you at both too! I love the flocked garland…looks so natural, and love the stockings too. I see you purchased them in my hometown! Very nice & congrats for decorating around your first mantel! I remember being able to do my first one. Where is your hometown? I’m in south Alabama. I think that the muted decor is beautiful and is something I use in my home frequently. The little bits of red and green make the mantle a focal point without it being too overwhelming. Love it!